Knitted in a laceweight silk yarn, this cardigan has a very slinky drape, and is cool enough for the hottest days of summer. 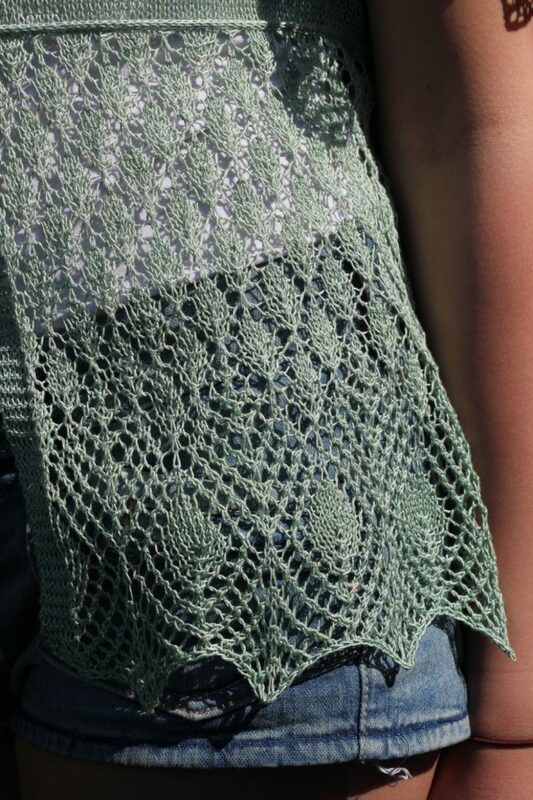 A great choice for showing off your lace knitting skills. The pattern is written for 14 sizes, from 32-58″ chests measured at the full bust measurement. You will need 745 – 1413 m (815 – 1545 yards) of 2ply laceweight yarn depending upon size. You will also need 5 size 8mm (1/3”) buttons. Blocked tension/gauge is 28 stitches and 36 rows per 10cm/4″ in stocking stitch/stockinette. Suggested needle size is 3mm/US 2½ for the stocking stitch and 2.75mm/US 2 for the lace. Initially the shoulders are shaped with increases in every row at each side of the saddle stitches. At the same time short rows drop the front neck. Once the shoulder point is reached the increases change location to shape the sleevecaps, ie the cardigan has simultaneous set-in sleeves. The skirt is knitted on picked up stitches from the applied icord at the empire waist. The lace patterns are both written out and charted to cater for all preferences. A schematic is included to guide in blocking. This pattern is also available in the ‘A Time To Knit’ collection (see ‘Books’).